Mix all ingredients in large bowl. Using a soft cloth, spread scrub onto surface (sinks, showers, etc.) and rub in a circular motion. Don’t be afraid to use a little elbow grease! Rinse and wipe clean. To store scrub, place in an airtight container. I love, love, love to use this recipe for my kitchen + bathroom sinks, as well as my tub. I attempted to take before and after shots of my bathtub…but, it just didn’t yield desirable photos. It didn’t show just how grimy the tub really was! With that said, in the past, I have used a vinegar and baking soda recipe (which works well for shower heads). However, I don’t like it for tubs and sinks as much as this scrub. The vinegar recipe not only smells, well…like vinegar. But, it is far more harsh on my bathtub. This recipe is much less abrasive, hence the “soft” scrub and it smells heavenly! Bonus! 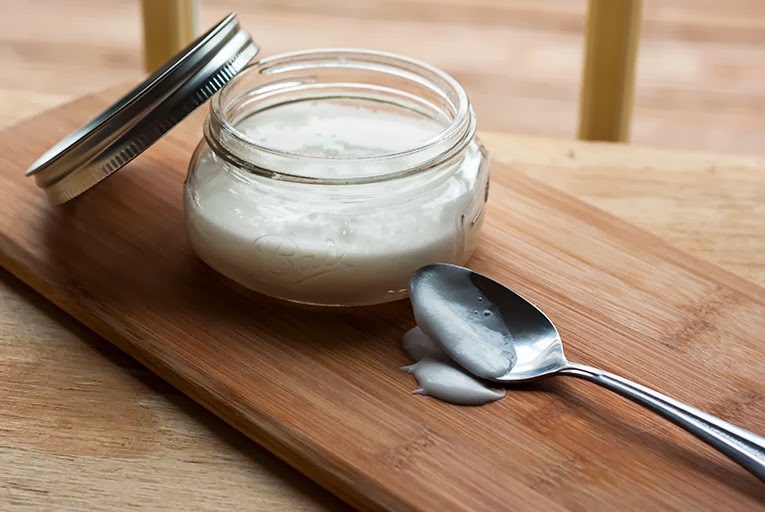 This recipe is probably one of my favorite natural cleaning products. I hope you give this simple recipe a try! Do you have a favorite natural cleaning product? ** There are blog posts in circulation that have used this recipe and included vinegar. DO NOT combine vinegar and castile soap. ** Make sure to rinse really well after use or you may leave an undesired film behind. 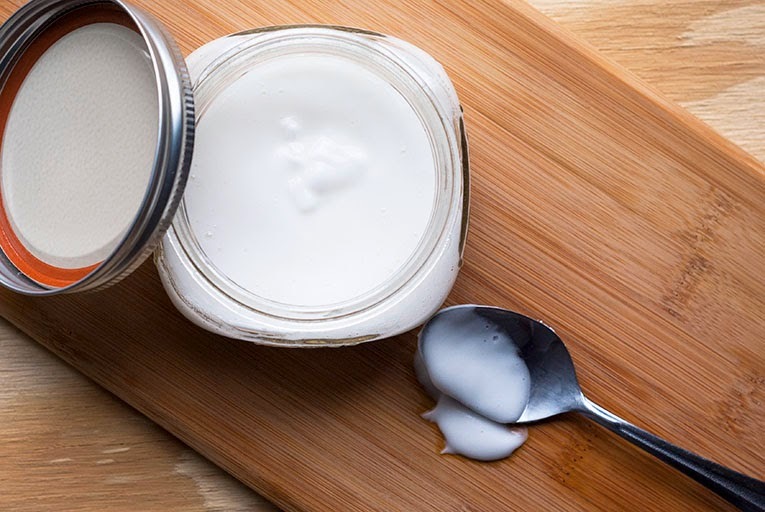 ** Store in an airtight container or mason jar. However, I usually just make a batch when I need it! Alli, you can use a little squeeze of Dawn soap too! But, there is something amazing about castile soap! I think peppermint oil would be a great option, and how about tea tree and lemon oils! Perfect clean, fresh scents! 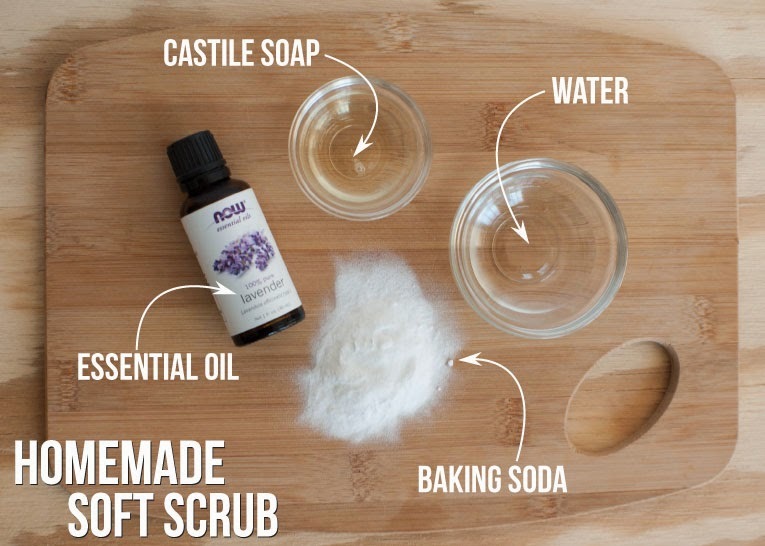 This looks like a great recipe, I am really loving natural cleaning products right now (I know, late to the game right). I’ll have to get my hands on some soap and give this recipe a try! What other oils do you recommend for a good cleaning smell? I have some peppermint oil cleaner and I love that fresh scent! Yes, I use that too! I like to use vinegar for my shower heads, drains, and faucets…as well as a glass cleaner. But, there is something about my whole shower smelling like vinegar that I don’t like! I tend to use vinegar/baking soda/tea tree essential oil to clean, but I love your vinegar-free version!